Since it’s the first day of spring and officially wedding season, I figured I would share our debt free wedding story. Weddings can be very expensive and time-consuming to plan. However, anything is possible when you put your mind to it. We actually planned our wedding ourselves (of course I did most of the legwork) and decided early on that we didn’t want to go into debt to have our wedding. We used the budget tool on Wedding Wire to help us stay organized when it came to our budget. And we used Google to find most of our vendors. Typically people set their budget for a wedding first and then find vendors that they can afford. However, I decided to work a little backwards after seeing how much weddings cost in 2011 when we were planning. The average cost for a wedding at the time was $27,021, which we could not fathom paying. I started by researching how a wedding budget would be broken down based on how much you wanted to spend. I came across a website which had wedding costs broken down by spending $5k, $10k, $15k, etc. It was then that we realized that with our large families and to include everything we wanted it wouldn’t be possible to have a $5k or $10k wedding. Luckily, we had almost a year from the time we got engaged to save for our wedding. We opened a joint account and saved like crazy. It’s probably not recommended to have a joint account if you’re not married, but we trusted each other. We did discuss how we would go about separating the money if for some reason we didn’t get married and parted ways. It would’ve been fairly easy to figure out how much each of us contributed to the account because although we were doing separate budgets at the time, we would share our budgets with one another so that we could see how much the other was able to save from each paycheck. Once we saved a good amount of money we decided that it was time to start booking our vendors and buying things for the wedding. As we got closer to our wedding date and down to the wire with saving, I suggested we get a credit card with a small limit just in case we needed more money. At this point, neither of us had any credit cards because we each paid them off and canceled them. So Omar got a credit card in his name, and we both agreed that we would only use it as a last resort. We’re definitely proud to say that we did a good job staying within budget although it was challenging at times (and no we did not use the credit card at all). So without further adieu, everything is detailed below in regards to the best money we ever spent… Our Debt Free Wedding Story. We looked at several venues, but when we did a tour of the Old Courthouse on the Square, we knew it was the place for us. We loved the architecture of the Courthouse and how the color scheme of the Courthouse went along with the colors of our wedding, which was gray and yellow. Although I really loved the courthouse as a venue for our wedding I was having a hard time parting with our money to book it. A deposit was required and it was non-refundable. This is really why I was hesitant to book it. It seemed like so much money ($600) just in case something didn’t work out. However, my hesitancy paid off because we ended up waiting until the end of the year to book them, and low and behold they were having an end of the year sale! This saved us $200. Another way we saved money on the venue is by having our wedding on a Thursday. Saturday is the most popular day of the week to have a wedding, followed by Sunday and Friday. However, if you can be flexible with the day of the week you choose to get married, then you might be able to save some money as well. Choosing to have our wedding at the Courthouse also saved us money because they allowed us to provide our own liquor, beer, and wine. We contemplated not serving any of the above at our wedding because that alone can cost thousands of dollars. However, by being able to provide our own alcoholic beverages we definitely saved a lot. That part of our wedding only cost $724.46. The catering company provided the bartenders, and the Courthouse required us to have a police officer during the time that alcoholic beverages were being served, which was an additional cost. One of my favorite vendors from our wedding was our photographers, Sophie and Derrick. When we met with Sophie she was very thorough and honest about not being in the business very long (at the time). By them being newer this helped us to save money yet again. However, you wouldn’t have guessed they had only been doing it for a year because our pictures turned out great! We were very realistic in what we could afford and what we wanted in terms of photography for our wedding. I love having pictures because at the end of the day all you have left are your memories. However, I wanted to make sure that we stayed within our budget. Instead of choosing one of the more expensive packages offered, we chose one that we could afford at the time. Initially, we chose not to get a wedding album with our package. We figured this was a way to cut costs. Big mistake! After seeing a sample album and seeing our own wedding pictures… I just had to have one! So we lost a little money by not including a wedding album with our original package. So please take my advice – get your wedding album! You won’t regret it. I still look at my wedding album from time to time and the memories come flooding back! Our DJ, DJ Battle, was actually the first vendor that I came across about a year before our wedding when we had thought about trying to get married in 2011, but it was just not working out with the way our money was setup! Luckily he was still available, and yet again we received another discount for waiting until the end of the year to book him when he was having a special promotion. He was the only DJ that we interviewed, just like most of the vendors for our wedding. It is definitely not recommended to only interview one person for each type of vendor that you want, but all of our vendors were just that great! Once DJ Battle found out that we were planning our own wedding, one of the most valuable pieces of information that I received came from him. He told us that even if we’re planning our own wedding we at least needed a day of coordinator. That way our sole focus would be enjoying our wedding day instead of having to worry about any mishaps that arose. I’m not exactly sure how much wedding coordinators cost, even if just for the day. However, we were able to save some money on this by having our sisters-in-love be our day of coordinators. Just a word of caution, this was only able to work for us because they regularly plan and host events. Therefore, I knew that they would be perfect for it and do a good job as well. Our caterer was Soiree and was a preferred vendor for our venue. We could’ve chosen a vendor not on their list, but then we would’ve had to pay an additional fee. So why pay any extra if we didn’t have to? In regards to our budget, we loved how they broke down the price list of every single thing. There was no doubt of where our $7k went. This is where the biggest chunk of our money went and the cost was directly related to the size of our guest list. Since we both have pretty big families we decided we would have an adults only wedding unless the kids were a part of our bridal party. Soiree did a fantastic job on the food; there are some people who still talk about it to this day. Since our wedding and reception were at the same place, Soiree was in charge of flipping the room from ceremony setup to reception setup. We had a cocktail hour so that we could take pictures and give Soiree time to flip the room for the reception. This was already included in the price for them. It was like a one-stop shop! Rev Dawn of Seventh Sense was our officiant. I found her online as well. 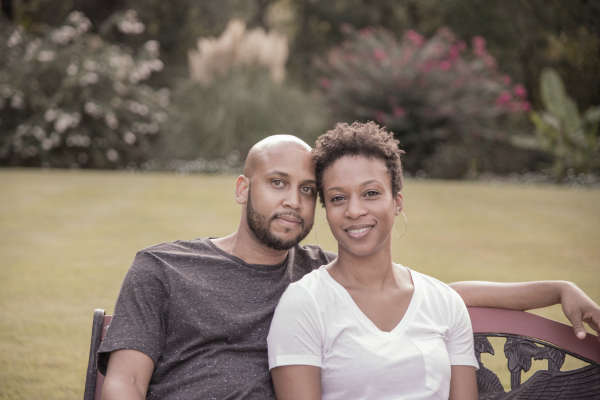 Omar was a little hesitant at first to use her because he wanted a guy for the premarital counseling so that he could “have someone on his side”. Lol. I told him that shouldn’t matter if we were choosing a neutral person. And we’re so glad we chose her. She was so sweet! She did our premarital counseling, which is something we highly recommend for anyone thinking about getting married. We have even seen her after our wedding just as a tune-up for our marriage. It did not take me long to find my dress. I already knew what I wanted. I went to one bridal store with my mom and tried on a few dresses, but none of them felt like “the one”. So I made an appointment for David’s Bridal and took my mom and two Matron of Honors with me. We pulled several different types of dresses, and after only 3 tries I found my perfect dress! My dress was a Galina Signature design. It was actually discontinued so I had to have it ordered from another David’s Bridal in another state. The good thing about that is I got a really good deal on the dress. I believe the original price was $1,000+, but I only paid $399 + taxes! Flowers for weddings can be very expensive. We did not want to spend money on a bunch of flowers that were going to die. Or at least this is what I told myself so that I couldn’t justify increasing the budget for flowers. So we had to make the tough decision of hiring a florist for some things and DIY’ing it for others. Our bouquets, boutonnieres, “alter” arrangement and flower petals for the flower girls came from a florist. The centerpieces were a different story. One of the most challenging things was deciding on the centerpieces for the reception tables. After brainstorming for a while, I decided we would do the centerpieces ourselves to save some money. We bought the vases and table number holders from Ikea. The preserved billy buttons came from afloral.com. We bought the lemons from our local farmer’s market. And I found a vendor on etsy.com to make our table numbers. In the end, it was nice seeing everything come together and knowing that we planned everything and made our own centerpieces! Although it would have been nice to have D&R Films record everything during the day of our wedding, it just wasn’t in our budget. We were able to save some money by having them record our ceremony up until our first dance. Our favorite part of our wedding day was the First Look. Originally, Omar was against doing the First Look. He said he did not want to do it because he felt that it would ruin the moment of seeing me come down the aisle. However, when we met with Sophie she asked if we would be doing a First Look. She shared her own experience and just from that alone Omar was sold on the idea. We enjoyed the First Look because it allowed us to be able to see each other before the wedding without having to wait all day until the time of the ceremony. For those that are hesitant about a First Look and if it will ruin anything, we personally do not feel so. We both cried doing the First Look, I cried before walking down the aisle, and then I cried during the ceremony! The First Look only made us feel better about the evening ahead. Our wedding budget did include things that people don’t usually include in their wedding budget. For example, our clothes for our engagement pictures; paying for my mom’s and niece’s dresses; the marriage license; getting my hair done; and gifts for each other, our parents, and our bridal party just to name a few. However, I liked that we included these things in our budget because we had to pay for it, and it was related to the wedding. Also, this helped us stay within budget since there weren’t any “surprise” costs along the way. Our grand total was $22,650.11, which was actually under budget by $547.13. Hey… every little bit counts! In the end, we absolutely enjoyed our wedding day (and definitely appreciate our vendors who helped to pull everything off). Regardless of if you choose to get married at a courthouse or have an all-out extravagant affair, make sure it’s about you and your soon to be spouse. It should be whatever the two of you want and can afford because ultimately the wedding lasts just a day, but the marriage will last a lifetime <hopefully>. Another Good Read! My wife, Alex, and I looked at the average cost of weddings and went with eloping at the courthouse/jailhouse (the courthouse wasn’t open on Sundays so we went to the country jail and had a magistrate marry us for 75 bucks). Then did a brunch/pictures, afterwards with immediate family(s). It truly is a great feeling NOT starting a marriage with insane debt from a wedding! Thanks! We debated doing a destination wedding or eloping as well. We could’ve saved the money and did something else with it, but we both agreed that no matter what we wouldn’t regret the amount of money we spent on our wedding. And so far, we still don’t regret it. But of course, we agree that it’s a great feeling to not start a marriage with debt from a wedding! I would advise anyone to do that. I completely agree! It’s awesome not having that debt. Instead, we can focus solely on the memories with out the debt payments bringing us down! great read… documentation down to the penny! Would you advise just delaying the wedding if there were additional things you wanted to do that just were not feasible in the time you had? Say you needed another 5k, 10k but wanted to still get married at a specific time? I would absolutely advise delaying the wedding if someone needed that amount of money to move ahead. Our goal was a debt free wedding because no matter how good or bad our wedding turned out… I didn’t want to get bills in the mail later to remind me of how much our wedding sucked if it had turned out badly! And we actually did delay our wedding (our first date choice was Nov 2011) because we knew we wouldn’t be able to save the amount of money needed that fast. Kim and I completely agree here. As you can see it’s exactly what we did. Before we got married we drew a line in the sand agreeing that we weren’t going to go into debt(with the exception of buying our first home) anymore. Not for anything. Great read. The detail in your budget breakdown is amazing and will be totally helpful to someone ready to jump the broom. Lol! Based on the photos, it seems like the “amateur” photographer was definitely a great choice and I think I got teary-eyed from the “First Look” photos. This was awesome! Lol. I can’t take all of the credit for the budget breakdown. That was all from Wedding Wire. Haha. But I do hope someone finds the information helpful if they’re planning a wedding. And yes, our photographers were definitely far from “amateur”. The first pic under the “first look” section is actually one of my favorite pictures. If you got teary-eyed from the picture, just imagine how I felt that day walking to see him for the “first” time! LoL. You guys really pulled this off. The way the wedding went I thought you had professionals doing the planning. One of the best wedding I have been to. I like you believe you should not go into a marriage with a debt like this. Oh wow! Thank you, Uncle Paul! That’s a huge compliment. 😀 We shared because we hope that it’ll help someone, somehow. Thank you for taking the time to read. Love you too! WOW!! Great read. What an amazing story …..The love and care for each other is so evident in the whole process. I know that God will bless you with many many many wonderful years together. Love you both!! Thank you! It really was an awesome day!